Do you know how Christmas cards developed through the years? Who invented the first Christmas card? Well, every year a lot of people all over the world send and receive Christmas cards. Though the tradition of exchanging cards at Christmas is 170 years old, the idea of greeting cards goes back to ancient Egypt when people gave each other symbolic gifts such as inscribed scarabs to celebrate the New Year. The Romans, for example, exchanged lamps with the inscription “May the New Year be happy and lucky for you”. In Europe in the 15th century wood engravers produced special prints which were inscribed with different legends wishing a Happy New Year. They were the prototypes of the modern Christmas cards. Later on in the 18th and early 19th centuries rich people, especially merchants, started sending printed greetings to their friends but they were not true Christmas cards. The first commercial Christmas card was produced in Britain in 1843 by Henry Cole, a founder of the Victoria and Albert Museum in London. Sir Henry asked his friend John Calcott Horsley, who was an artist, to create a Christmas card. The idea was to encourage people to help those in need. The card was divided into three parts by poles and vines. On the left and on the right sides of it there were scenes of Christmas charity while the centre part depicted a happy family, including a child sipping wine. The words “A Merry Christmas and a Happy New Year to You” were scrawled in front of the card. Space was left at the top for writing the name of the recipient and at the bottom for writing the name of the sender. In spite of the fact that there was a lot of criticism as it was not socially correct for a child to drink alcohol, the Christmas card was a hit. 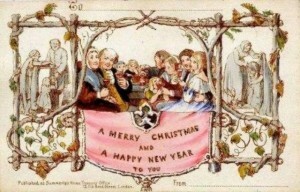 Throughout the Victorian period most of the cards tended to be New Year cards rather than Christmas cards. In 1862 Charles Goodal created cards with the words “A Merry Christmas” written on them and soon religious –themed cards followed. Until 1815 Americans imported the cards from England. Later that year Louis Prang opened his own shop to print off Christmas cards. By the year 1881 he had sold nearly 30 million cards! Since then cards have progressed by leaps and bounds. They came in many different shapes such as bells, animals and stars. Satin and silk were often used to make Christmas cards more elegant. But the all-time favourites were pop-ups, tab-cards and sound-cards. At present Christmas cards are being produced not only for profit. Charities often sell their own Christmas cards to raise money at Christmas. Victorian Christmas cards often showed a robin delivering Christmas mail that’s why postmen in Victorian England were popularly called “robins” because their uniforms were red. In the UK an estimated £50 million is raised by Christmas cards for charities each year. One of the Sir Henry Cole’s first Christmas cards, which he sent to his grandmother was sold at auction for $35,800 (£22,500) in 2001. 45% of all cards sent are Christmas cards but only 15% are bought by men. 1,5 billion Christmas cards are sent in the USA each year. Many Americans try to send Christmas cards and presents from Bethlehem, Santa Claus and Christmas. Bethlehem is in Connecticut, Santa Claus is in Indiana and Christmas is in Florida. In 1988 the world-famous singer Madonna sent out Christmas cards to her friends. It was a picture of herself and her daughter, just like “Madonna and child”. Each year in Finland Santa receives 600,000 cards. This videocard I have created for you, dear readers! If you like it, you may share it with your friends and relatives. O. Henry "The Gift of the Magi"
Эта запись написана автором Елена Шрамкова, 26.12.2015 в 01:28, и размещена в категории Christmas Time, Традиции и обычаи Великобритании. Следите за ответами на эту запись с помощью RSS 2.0. Вы можете написать комментарий или разместить обратную ссылку на своем сайте.